On November 14, 2018, the Michigan Department of Environmental Quality (DEQ) announced the completion of the removal of the Alcott Dam on Portage Creek in the city of Kalamazoo. I (Storm Cunningham) was in Kalamazoo in 2017, doing talks and workshops for the Kalamazoo County Land Bank and for the annual conference of the Michigan Association of Land Banks (in Battle Creek). While there, the interrelated subjects of the removing Alcott Dam, cleaning up the Allied Paper Superfund Site and ecologically restoring both Portage Creek and the Kalamazoo River were subjects that came up repeatedly. So, the completion of this dam removal is definitely being celebrated in that lovely city. 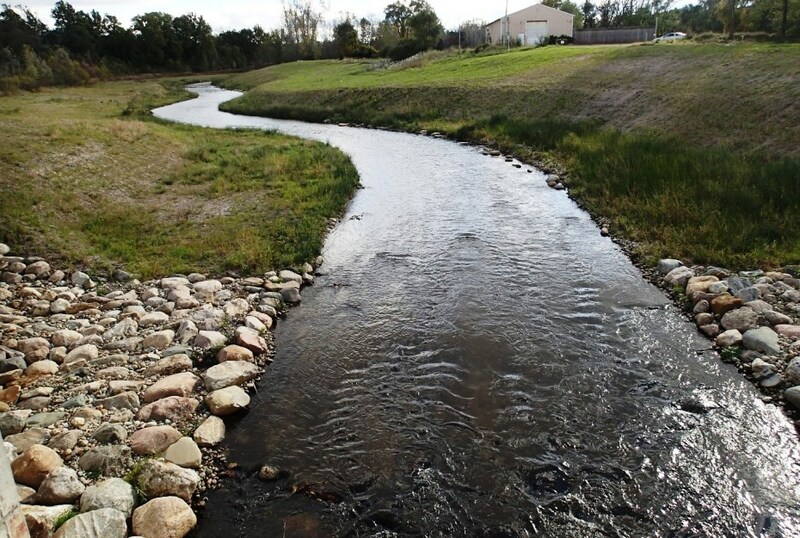 The project is expected to restore natural resources by improving habitat in and along a section of Portage Creek upstream of Alcott Street and allowing fish to swim freely through the former dam area and upstream an additional approximately 1.5 miles of the creek. Alcott Dam prior to removal. 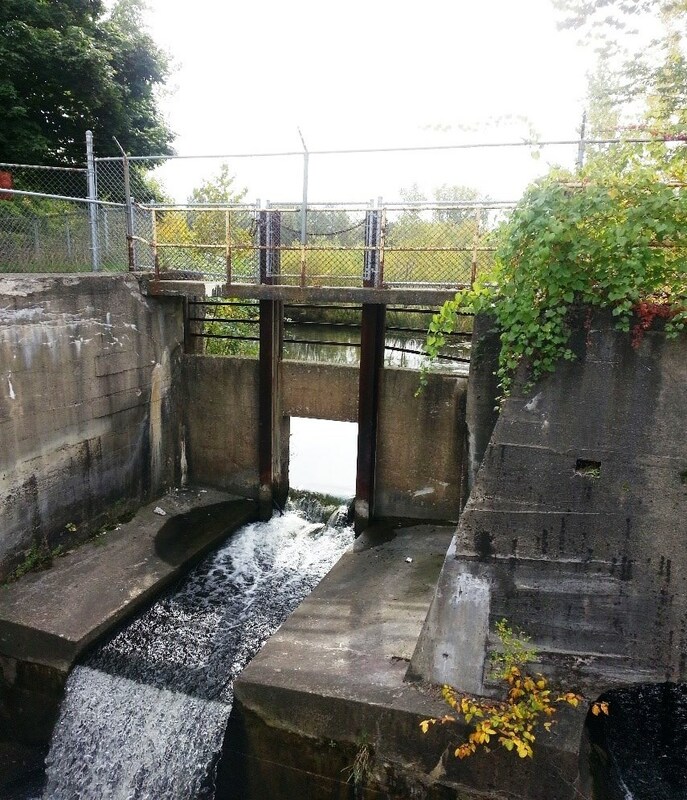 The Alcott Dam removal project was funded with $2,000,000 from the Kalamazoo River Natural Resource Damage Trustees. The Trustee agencies are the United States Fish and Wildlife Service, the National Oceanic and Atmospheric Administration, the Michigan Department of Natural Resources, the Michigan Office of Attorney General, and the DEQ. The DEQ also provided approximately $3,100,000 in additional funding for the project to conduct a feasibility study, and to characterize, excavate and properly dispose of contaminated soils and sediments. The Kalamazoo River Natural Resource Trustees’ portion of funding for the project came from a bankruptcy settlement with LyondellBasell Industries, a liable party for the polychlorinated biphenyls (PCBs) contamination of Portage Creek and the Kalamazoo River. The removal of the dam was a high priority project in the Trustees’ restoration plan for Portage Creek. In addition to removing the dam to improve fish passage and riparian habitat, the project restored 3,000 feet of the creek and its floodplain upstream of the former dam using natural channel features like creating rock riffles and brush bundles, providing low-lying wetland areas that increase floodplain capacity, and planting native vegetation. As wonderful as the dam removal is, Portage Creek—and the Kalamazoo River it flows into—have another problem: severe contamination. The good news is that state and federal government agencies are working hard to restore the waterways in that manner, as well. 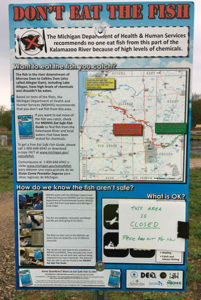 Fish consumption warning sign along the Kalamazoo River during cleanup work in 2018. Photo: Paul Ruesch, U.S. EPA. Industrial activities on the Kalamazoo River and Portage Creek released polychlorinated biphenyls (PCBs) to those waterways and the surrounding environment. As a result, the U.S. EPA designated areas downstream of the releases of PCBs as the Allied Paper, Inc./Portage Creek/Kalamazoo River Superfund Site. The U.S. EPA and the Michigan Department of Environmental Quality are working to clean up the contaminants in the river system and/or or halt the risk from them in some way. For the current status of the cleanup process, visit EPA’s Kalamazoo Project website or MDEQ’s website on the Allied Paper, Inc./Portage Creek/Kalamazoo River Superfund Site. Meanwhile, the Trustees for natural resources are conducting a Natural Resource Damage Assessment (NRDA). In the NRDA, the Trustees will determine the amount of restoration needed both to return the Kalamazoo River Environment to what it would have been like if the contaminants had not been released and to compensate the public for the loss of use and enjoyment of their natural resources resulting from the contaminants. In order to determine the amount of restoration and compensation required, the Trustees first evaluate the amounts and types of injuries to natural resources that result from the contaminants in the environment. 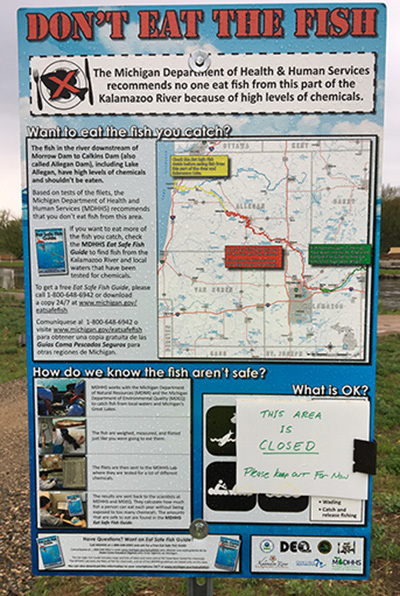 Injuries include things like poor reproduction in bald eagles and mink and fish consumption advisories for anglers in the area. The Trustee agencies for this NRDA are the U.S. Fish and Wildlife Service, the Michigan Department of Environmental Quality, the Michigan Department of Natural Resources, the Michigan Department of the Attorney General, and the National Oceanic and Atmospheric Administration. Unless otherwise credited, all photos courtesy of Michigan DEQ. Learn more about the project, the restoration plans, and the Kalamazoo Natural Resource Damage Assessment.